Remediation Strategies were requested by a major prestige vehicle manufacturer based in North-West England to provide assistance in upgrading their production facility’s surface water protection measures. The site had recently experienced potential regulatory compliance issues with its surface water discharge and staff wanted to take positive action to prevent future occurrences. Working with the client, Remediation Strategies identified a number of pollution prevention and control measures to help prevent non compliant surface water discharges from occurring. The client identified difficulties with sub-contractors working on site not being able to tell the difference between surface water and foul water drains. Remediation Strategies were able to recommend and subsequently supply several hundred ‘Drainmarker’ discs for use adjacent to drains at the site (pictured above). In terms of responding to spill incidents, Remediation Strategies were able to advise and subsequently supply a number of pollution control devices to help contain any spillages locally. The Portable Draintector is a bladder based device that can be inserted into a drain (near a spill location) and inflated to help contain the spilled product. These kits are hand portable, quick to assemble and can be inflated using a small hand pump. A total of 3 kits were supplied. To afford the entire site full protection, Remediation Strategies were again able to advise and subsequently supply a full size permanently installed Draintector system at the site outfalls. The twin bladder system can be activated by remote control through a 3G mobile phone connection and can block the discharge from the entire site within 1 to 2 minutes of activation. This then allows the outflow to be diverted for treatment prior to allowing discharge again. Remediation Strategies were requested to provide advice and subsequently to supply a number of pollution prevention and control measures to assist an automotive manufacturer comply with their surface water discharge limits. 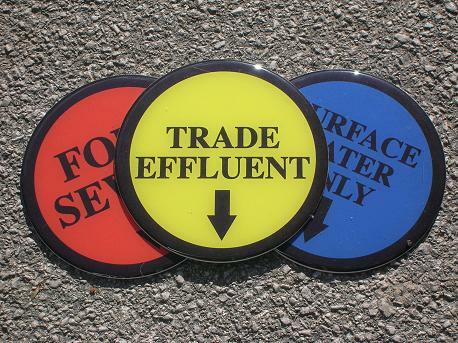 A combination of drain identification markers, portable Draintector bladders for isolating individual drains and a full scale Draintector system installed at the site outfall were supplied to the client. The pollution prevention and control measures were supplied and installed between November 2010 and February 2011. Or see more Pollution Prevention and Contol case studies.